VanEck NDR Managed Allocation Fund tactically adjusts its asset class exposures each month across global stocks, U.S. fixed income, and cash. 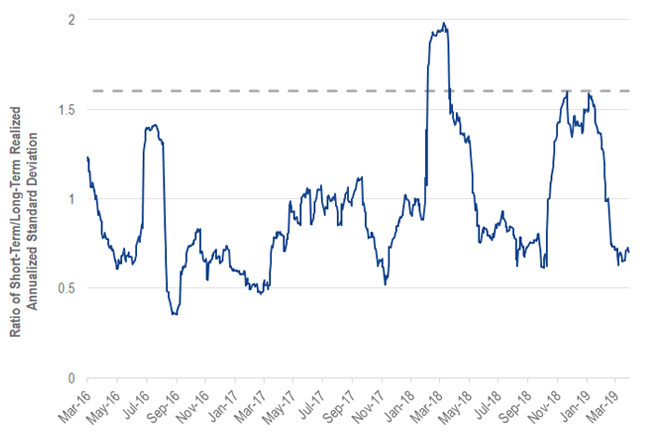 The VanEck NDR Managed Allocation Fund (the "Fund") returned 1.20% versus 1.56% for its benchmark of 60% global stocks (MSCI All Country World Index) and 40% bonds (Bloomberg Barclays US Aggregate Bond Index) in March. VanEck NDR Managed Allocation Fund (MUTF:NDRMX) tactically adjusts its asset class exposures each month across global stocks, U.S. fixed income, and cash. It utilizes an objective, data-driven process driven by macroeconomic, fundamental, and technical indicators developed by Ned Davis Research ("NDR"). The Fund invests based on the weight-of-the-evidence of its objective indicators, removing human emotion and decision making from the investment process. The expanded PDF version of this commentary can be downloaded here. Indicators second-guess the "V" shaped recovery. Macroeconomic and fundamental indicators are mixed. Economic activity and earnings growth are slowing, and the cyclical sectors are outperforming. Technical indicators, too, are mixed. Quick responding market price indicators turned bullish. However, the longer-term price based indicators are skeptical about this rally. Sentiment among analysts is improving. More analysts are revising upward their estimates of future earnings. In March, global stocks returned 1.31% and U.S. bonds returned 1.92%. 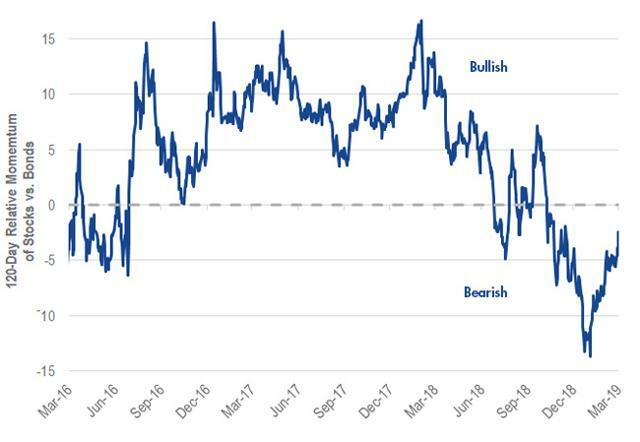 The asset class positioning of the Fund was neutral relative to the benchmark, with approximately a 60% allocation to stocks and 40% allocations to bonds. The largest relative overweight equity region positions were to both the U.S. and the Emerging Markets. The largest relative underweight equity region positions were the positions in Europe ex. U.K. and Japan. Within U.S. equities, the Fund was overweight growth over value and large-cap over small-cap. The Fund remains allocated 60% to stocks and 40% to bonds. The neutral positioning is based on conflicting signals from technical, macroeconomic, fundamental, and sentiment indicators. The tables present past performance which is no guarantee of future results and which may be lower or higher than current performance. Returns reflect applicable fee waivers and/or expense reimbursements. Had the Fund incurred all expenses and fees, investment returns would have been reduced. Investment returns and Fund share values will fluctuate so that investor's shares, when redeemed, may be worth more or less than their original cost. 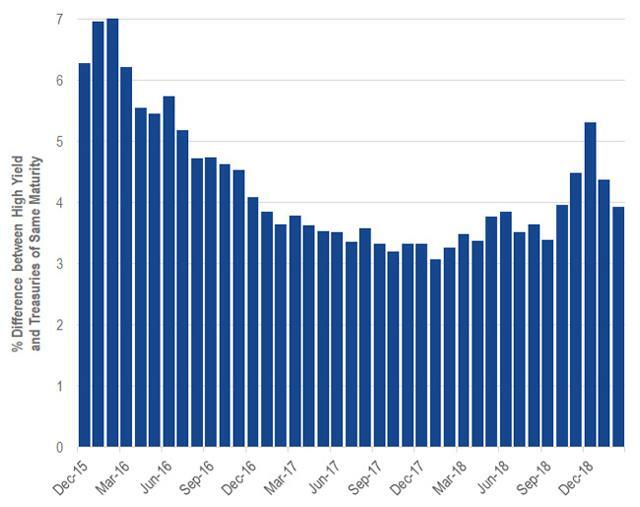 Fund returns assume that dividends and capital gains distributions have been reinvested in the Fund at net asset value (NAV). An index's performance is not illustrative of the Fund's performance. Indices are not securities in which investments can be made. Index returns assume that dividends of the Index constituents in the Index have been reinvested. †Returns less than a year are not annualized. Expenses: Class A: Gross 2.33%; Net 1.39%. Expenses are capped contractually until 05/01/19 at 1.15% for Class A. Caps excluding acquired fund fees and expenses, interest, trading, dividends, and interest payment of securities sold short, taxes, and extraordinary expenses. The evidence remains conflicted. Stocks are up this year, way up. The S&P 500 Index has returned 13.65%! This is a classic "V" shaped recovery. 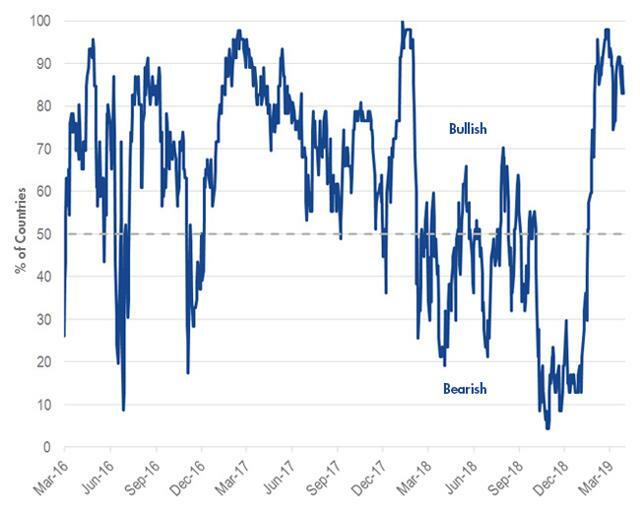 The tranquility in the markets and the general lackadaisical view of risk is astonishing given the pain that investors experienced not too long ago. U.S. stocks started 2018 with a 10% correction and ended with nearly a 20% correction. Let's take a look at the indicators. Market volatility and credit spread indicators are two classic risk metrics. They are telling us: "Jump in, the water is warm!" Copyright 2019 Ned Davis Research, Inc. Further distribution prohibited without prior permission. All Rights Reserved. See NDR Disclaimer at www.ndr.com/copyright.html. For data vendor disclaimers refer to www.ndr.com/vendorinfo/. Source: Bloomberg. Data as of March 2019. Past performance is no guarantee of future results. Charts are for illustrative purposes only. Investors cannot invest directly in an index. Another bullish sign is that market breadth, a measure of global country participation, is bullish. Over 80% of countries are above their intermediate-term average. Generally, healthy market participation is good for stocks. But the macroeconomic and fundamental indicators are warning us to be cautious. The problems that caused the fourth quarter correction, namely slowing global growth and earnings weakness, are still here. Below is a heat map of global PMI data. It shows the rate of change over the past 12 months. 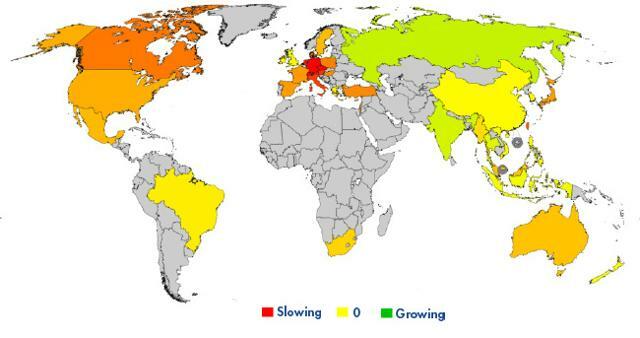 As you can see, economic activity is slowing. 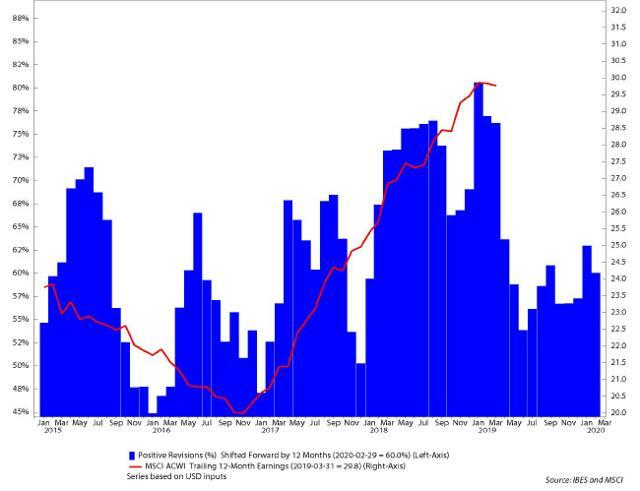 The next chart shows two conflicting signals: (1) that corporate earnings growth is slowing (red line) and (2) that the percentage of companies with positive earnings revisions is increasing (blue bars). Global earnings growth is cooling off and this bearish for stocks. The bullish news is that analysts are revising upwards their projections of 12-month earnings. And lastly, the long-term momentum indicators still don't trust the rally. Below is a 120-day relative momentum indicator. Although it is recovering, the indicator remains bearish. Long-term price indicators see past near-term market moves to capture the overall direction of the market. As of now, that direction is down. The roads to market bottoms are typically neither straight nor well lit, but full of twists and turns with low visibility. Given that, neutral and cautious is a good place to be. 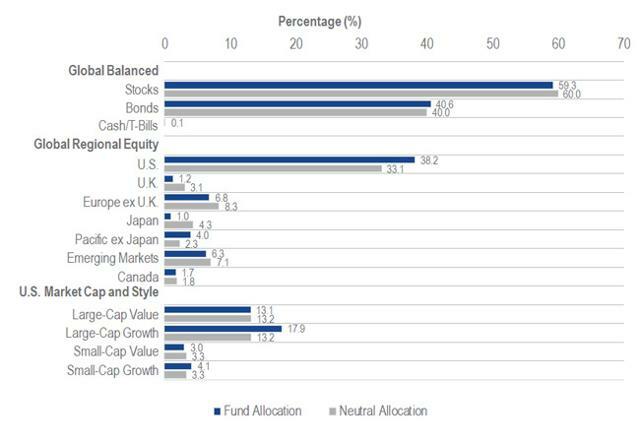 The neutral allocation, which is provided by Ned Davis Research, Inc., represents the starting point of the Fund's model absent an alternative recommendation once the model takes into consideration the indicators that yield the global tactical allocation model. These are not recommendations to buy or sell any security. *All weighting comparisons are relative to the blended benchmark (60% MSCI ACWI/ 40% Bloomberg Barclays US Agg.) or neutral allocation. This represents the starting allocation point absent an alternative recommendation once the model takes into consideration the indicators that yield the global tactical allocation model. 1 Morningstar category averages are equal-weighted category (total) returns. The calculation is the average of the total returns for all funds in a given category. The standard category average calculation is based on constituents of the category at the end of the period. Total return reflects performance without adjusting for sales charges or the effects of taxation, but is adjusted to reflect all actual ongoing fund expenses and assumes reinvestment of dividends and capital gains. If adjusted, sales charges would reduce the performance quoted. The Morningstar Tactical Allocation category includes portfolios that seek to provide capital appreciation and income by actively shifting allocations across investments. These portfolios have material shifts across equity regions, and bond sectors on a frequent basis. To qualify for the tactical allocation category, the Fund must have minimum exposures of 10% in bonds and 20% in equity. Next, the Fund must historically demonstrate material shifts in sector or regional allocations either through a gradual shift over three years or through a series of material shifts on a quarterly basis. Within a three-year period, typically the average quarterly changes between equity regions and bond sectors exceeds 15% or the difference between the maximum and minimum exposure to a single equity region or bond sector exceeds 50%. As of December 31, 2018, the Fund ranked 134 out of 283 funds for the 1 month period; 173 out of 283 funds for the YTD period; 173 out of 283 funds for the 1 Year period; and 101 out of 266 funds since inception. As of February 28, 2019, the Fund ranked 219 out of 284 funds for the 1 month period; 217 out of 284 funds for the YTD period; 220 out of 280 funds for the 1 Year period; and 128 out of 262 funds since inception. The Fund's benchmark is a blended unmanaged index created by the Van Eck Associates Corporation (the "Adviser") consisting of 60% MSCI All Country World Index (NASDAQ:ACWI) and 40% Bloomberg Barclays US Aggregate Bond Index. The MSCI ACWI captures large- and mid-cap representation across 23 developed markets (DM) and 24 emerging markets (EM) countries and covers approximately 85% of the global investable equity opportunity set. The Bloomberg Barclays US Aggregate Bond Index is a broad-based benchmark that measures the investment grade, U.S. dollar-denominated, fixed-rate taxable bond market. This includes treasuries, government-related and corporate securities, mortgage-backed securities, asset-backed securities and collateralized mortgage-backed securities. Global stocks are measured by the MSCI ACWI and U.S. bonds are measured by the Bloomberg Barclays US Aggregate Bond Index. Large-cap stocks are measured by the Russell 1000 Index, an index of the largest 1,000 companies in the Russell 3000 Index. The Russell 1000 Index comprises over 90% of the total market capitalization of all listed U.S. stocks. Small-cap stocks are measured by the Russell 2000 Index, an index which measures the performance of the smallest 2,000 companies within the Russell 3000 Index. Value stocks are measured by the Russell 3000 Value Index, a market-capitalization weighted equity index based on the Russell 3000 Index, which measures how U.S. stocks in the equity value segment perform. Included in the Russell 3000 Value Index are stocks from the Russell 3000 Index with lower price-to-book ratios and lower expected growth rates. Growth stocks are measured by the Russell 3000 Growth Index, a market capitalization weighted index based on the Russell 3000 Index. The Russell 3000 Growth Index includes companies that display signs of above-average growth. Companies within the Russell 3000 Index that exhibit higher price-to-book and forecasted earnings are used to form the Russell 3000 Growth Index. U.S. stocks are measured by the Russell 3000 Index which is a capitalization-weighted stock market index that seeks to be a benchmark of the entire U.S stock market. It measures the performance of the 3,000 largest publicly held companies incorporated in America and is based on market capitalization. The MSCI Europe ex UK Index captures large and mid cap representation across 14 Developed Markets (DM) countries in Europe. The MSCI Canada Index is designed to measure the performance of the large and mid cap segments of the Canada market. The MSCI Pacific ex-Japan Index captures large and mid cap representation across 4 of 5 developed markets (DM) countries in the Pacific region (excluding Japan). Emerging Market stock are measured by the MSCI Emerging Markets Index which captures large and mid cap representation across 24 Emerging Markets (EM) countries. The MSCI United Kingdom Index is designed to measure the performance of the large and mid cap segments of the UK market. The S&P 500® Index consists of 500 widely held common stocks, covering four broad sectors (industrials, utilities, financial and transportation). International stocks are measured by the MSCI EAFE captures large and mid cap representation across 21 Developed Markets countries around the world, excluding the US and Canada. U.S. Dollar Index (DXY) indicates the general international value of the U.S. dollar. The DXY does this by averaging the exchange rates between the U.S. dollar and six major world currencies: Euro, Japanese yen, Pound sterling, Canadian dollar, Swedish kroner, and Swiss franc. Please note that the information herein represents the opinion of the author, but not necessarily those of VanEck, and these opinions may change at any time and from time to time. Non-VanEck proprietary information contained herein has been obtained from sources believed to be reliable, but not guaranteed. Not intended to be a forecast of future events, a guarantee of future results or investment advice. Historical performance is not indicative of future results. Current data may differ from data quoted. Any graphs shown herein are for illustrative purposes only. No part of this material may be reproduced in any form, or referred to in any other publication, without express written permission of VanEck. All indices are unmanaged and include the reinvestment of all dividends, but do not reflect the payment of transaction costs, advisory fees or expenses that are associated with an investment in the Fund. Certain indices may take into account withholding taxes. An index's performance is not illustrative of the Fund's performance. Indices are not securities in which investments can be made. Results reflect past performance and do not guarantee future results. You can lose money by investing in the Fund. Any investment in the Fund should be part of an overall investment program rather than a complete program. Because the Fund is a "fund-of-funds," an investor will indirectly bear the principal risks of the exchange-traded products in which it invests, including but not limited to, risks associated with cash and cash equivalents, debt securities, exchange traded products, exchange traded products' underlying investments, below investment grade securities, commodities and commodity-linked derivatives, commodities and commodity-linked derivatives tax, common stock, concentration, derivatives, emerging markets, investment style, small-, medium- and large-capitalization companies, market, model and data, operational, portfolio turnover and regulatory risks. The Fund will bear its share of the fees and expenses of the exchange-traded products. Consequently, an investment in the Fund entails more direct and indirect expenses than a direct investment in an exchange-traded product. Because the Fund invests in exchange-traded products, it is subject to additional risks that do not apply to conventional mutual funds, including the risks that the market price of an exchange-traded product's shares may be higher or lower than the value of its underlying assets, there may be a lack of liquidity in the shares of the exchange-traded product, or trading may be halted by the exchange on which they trade. Principal risks of investing in foreign securities include changes in currency rates, foreign taxation and differences in auditing and other financial standards. Debt securities may be subject to credit risk and interest rate risk. Investments in debt securities typically decrease in value when interest rates rise. Please call 800.826.2333 or visit vaneck.com for performance information current to the most recent month-end and for a free prospectus and summary prospectus. An investor should consider the Fund's investment objective, risks, charges and expenses carefully before investing. The prospectus and summary prospectus contain this as well as other information. Please read them carefully before investing.